Enjoy cost-effective innovations when accessing your SCADA system with any mobile device on the road with MetroCloud SCADA. Traditional SCADA (Supervisory Control and Data Acquisition) Systems require significant upfront capital investment such as servers, software licenses, IT infrastructure, and communication infrastructure. Recurring costs such as annual software support, phone, Internet, computer maintenance or replacement, IT costs and communication systems maintenance can put a strain on budgets, especially for smaller municipalities and industrial and commercial customers. To stay on the forefront of technology, Metropolitan Industries’ Research and Development team created MetroCloud, a cloud based SCADA system. MetroCloud uses a cloud infrastructure hosted from secure 3rd party suppliers. MetroCloud offers the most complete and reliable cloud infrastructure available with a 99.9% uptime and multiple server configuration separated geographically in fault redundant zones. Additionally, MetroCloud systems have the same functionality of a locally hosted SCADA computer and can provide thin client access from all smart personal devices whether iOS, Android, Windows, computer, tablet, or phone. 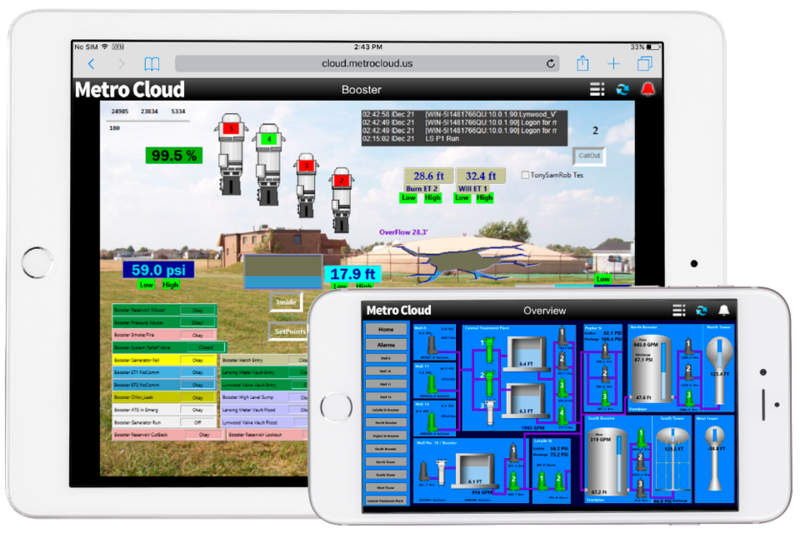 MetroCloud is an affordable solution to those seeking to improve their existing SCADA systems. Metropolitan Industries has kept it simple; $0 upfront licensing costs, $0 integration costs (on standard products) and $0 annual support costs. MetroCloud has low monthly fees and minimal setup fees for most systems, saving a lot of costs for SCADA systems. Municipalities can reallocate funds to other critical areas typically associated with SCADA systems, such as PLC and controls upgrades supporting their SCADA system. MetroCloud also provides enhanced security to its systems to eliminate the common problems of malicious intent, malware, viruses and physical security. MetroCloud’s security has the combined efforts of several programs. All information coming or going from the MetroCloud is secure. For customer remote access, SSL VPN tunnels are used to ensure information is encrypted and secure. For cellular based communication, MetroCloud has created private network connections to our cellular partners and utilizes only private IP addresses to cellular devices. For Ethernet based communication, IPSEC VPN tunnels use the military grade encryption algorithms to protect data. With MetroCloud, all servers are in the cloud – this eliminates physical security concerns related to computer/server access. MAC address filtering secures network access at physical locations rejecting all devices not intended to be on the network. Further easing security concerns, customer-side equipment is never exposed to the Internet. Bottom-line, MetroCloud provides the most secure and reliable SCADA solution on the market today. MetroCloud customers also have access to “best in the business” control system personnel with over 100+ years of combined real world experience engineering, installing, and maintaining SCADA systems and controls. In addition, MetroCloud has an ever-growing library of online resources, YouTube videos, quick-start guides and a 24-7 support number. Metropolitan Industries has supplied remote alarm and monitoring systems for operators and maintenance personnel to monitor and control their systems for over 35 years. This same SCADA technology is now available for building maintenance staff and industrial customers seeking to inexpensively monitor their equipment. With MetroCloud, costs associated with BAS and Industrial plant applications are a thing of the past. Standard Metropolitan control products are MetroCloud “SCADA ready” to handle many typical applications including: booster pump, break tank, tower fill, lift station, temperature control, pressure control, level control, and more. Thinking About an Upgrade to Your Pump Monitoring Capabilities? Visit our dedicated MetroCloud website or contact Metropolitan for a demonstration and for details on your system.